RVHS senior Rachel Horner attempts a spike during the Lady Raiders 3-1 match victory over South Gallia on Monday in Bidwell, Ohio. SGHS junior Christine Griffith attempts a dig during the Lady Rebels 3-1 setback to River Valley on Monday night in Bidwell, Ohio. BIDWELL, Ohio — Twice as nice. The River Valley volleyball team picked up a three games to one victory to earn a season sweep over non-conference visitor South Gallia in Monday night’s contest between Gallia County squads. The win provided a season sweep for the Lady Raiders over the Lady Rebels, having previously earned a 3-0 match victory on Aug. 23 in Mercerville. The match also served as the Lady Raiders’ annual Volley For The Cure fundraiser event. The Lady Rebels (7-10) charged to a 5-0 advantage in game one, but the Lady Raiders (8-9) managed to cut the deficit to just three points at 10-7. SGHS, however, manufactured a 15-6 run en route to a 25-13 win. The second game favored RVHS early, as they surged to a 7-1 lead. The host never trailed in the set, as they closed on a 18-10 scoring run to take a 25-16 victory. Following a 1-all tie in the third set, River Valley outscored South Gallia 24-13 the rest of the way, en route to a 25-14 win and 2-1 advantage in the match. The fourth game tightly contested as SGHS jumped to a 7-0 advantage, but a 14-7 scoring run by the hosts knotted the contest at 14-all. From there, the two squads engaged in a see-saw exchange for the lead before again tying the game at 19-apiece. River Valley, however, closed on a 6-3 scoring run, earning a 25-22 win and 3-1 match victory. The Lady Raiders service attack was led by Mikenzi Pope with 19 points, including seven aces, while Alex Woods was next with eight service points, including six aces. Kelsey Brown was next with seven service points, as Rachel Horner and Kasey Birchfield each followed with five points apiece, respectively. Lora Kinney and Cierra Roberts rounded out the RVHS service attack with two points apiece, respectively. The Silver and Black finished the contest with 31 kills, 21 digs and four blocks. The Lady Rebels service attack was led by Rachal Colburn with 15 points, including three aces, while Christine Griffith followed with 10 service points. Amaya Howell was next with seven points, including one ace, as Emma Shamblin followed with four service points. Makayla Waugh closed out the SGHS service attack with one point. South Gallia finished the match with 23 kills, 58 digs and four blocks. Following the triumph, second-year RVHS head coach Brent Smith focused on the life lessons such a match encompassed for this players. Despite the setback, third-year SGHS head coach Sarah Shirley was candid in her response regarding the game’s greater purpose. River Valley returned to action on Tuesday traveled to face Tri Valley Conference Ohio Division foe Nelsonville-York. The Silver and Black looked to avenge a 3-1 setback to NYHS on Sept. 6 in Bidwell. South Gallia also was back in action on Tuesday with a road date against Southern in a TVC Hocking Division contest. 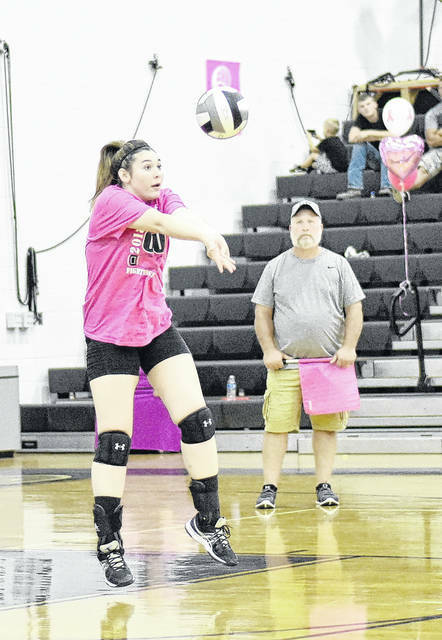 The Lady Rebels were in search of a season sweep of the Lady Tornadoes, having previously earned a 3-1 match victory on Sept. 11 in Gallia County.